Get ready for an entertainingly confounding, comedic, stage thriller when Scripps Ranch Theatre (SRT) opens its new season with Alan Ayckbourn’s “Communicating Doors,” Sept. 7-Oct. 7. Written by acclaimed playwright and director Ayckbourn, “Communicating Doors” tells the story of three women who all have business in the same hotel suite. One of the women has narrowly escaped being murdered, one is about to be murdered, and the other was murdered two decades before. That may seem a little confusing, time-wise, until you realize that the door in the corner, the “communicating door” that connects two hotel rooms, leads back to the same suite 20 years earlier. “It’s a thriller with a time warp,” said Jacqueline Ritz, who is directing the play for SRT. 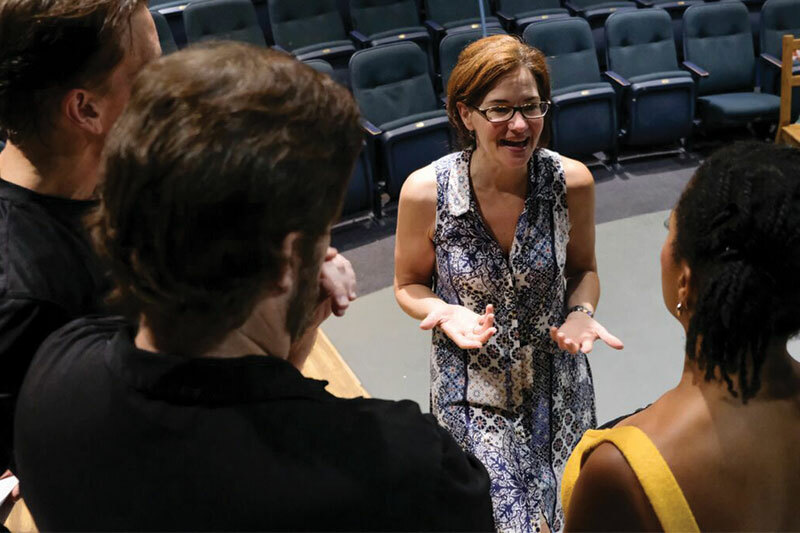 Ritz, who previously directed “Accomplice” at SRT, is excited to direct Ayckbourn’s time-shifting thriller in the local theater space. With its time shifting elements, the play covers a 40-year period — the present day, 20 years in the future, and 20 years in the past. “Communicating Doors” was originally set in the year it was written, 1994, so characters were going back to 1974 and up to 2014. The Scripps Ranch Theatre version is set in 2005, so the past is 1985 and the future is 2025. The director believes the way that the play goes back and forth in time to illuminate the plot and present possible alternative realities for all of the characters involved presents questions ripe for contemplation. The cast is led by Kate Rose Reynolds as “Poopay” and Wendy Waddell as “Ruella.” Also featured on the production are Charles Peters, Sibongile Ngako, Wendy Waddell, Paul Morgavo and John W. Wells III. Ritz describes “Opening Doors” as a dynamic play that offers something for everyone. Scripps Ranch Theatre is on the campus of Alliant International University, 9783 Avenue of Nations. “Communicating Doors” runs Sept. 7-Oct. 7. To reserve seats, call (858) 578-7728. For ticket price information, visit scrippsranchtheatre.org.